Katie Bryant is just 15 years old, and is suffering from Hodgkin’s Lymphoma. Nevertheless she has been involved in raising funds for the Piam Brown unit of Southampton Hospital, which is an oncology and haematology centre caring for children from birth to 16 years. Several thousand pounds were raised at an event in Tongham and at Santander Bank in Alton. As well as the Piam Brown ward, the CLIC Sargent cancer charity for children and young people also benefited. 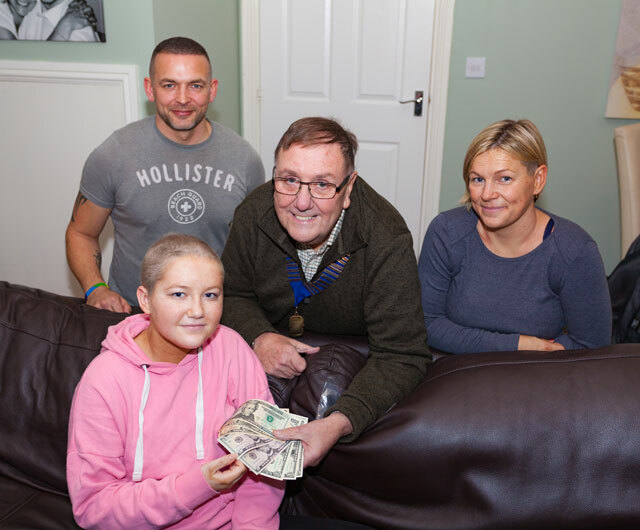 One of the objectives of the fund raising was to raise enough money to pay for Katie to have a trip to New York, and this will happen in January. To help her enjoy her trip Alton Lions have donated $100 spending money, which was presented by Alton Lions President Peter Bacon. Katie Bryant with Mum and Dad, Helen and Paul, being presented with $100 by Alton Lions President Peter Bacon. Previous Previous post: The Cakes Arrive On Time & Prices Same As Last Year!